Mosi-Off bands are ideal for providing added protection alongside Trek. 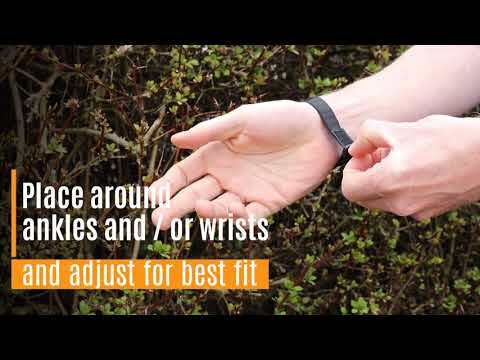 These adjustable wrist (or ankle) bands are treated with dry micro-encapsulated DEET and slowly release a repellent vapour for long-lasting protection. The bands repel insects seven hours a day, for up to 14 days – great added protection for a two-week holiday. Not suitable for children under three. Available in packs of four. For more information on DEET and Citriodiol, see our FAQs. Mosi-Off Repellent Bands (4 pack) provide up to 100 hours of protection if returned to the bag after use. The length of protection provided is dependant on a variety of factors including perspiration and activity. Place around the ankles or wrists and adjust for best fit. After use return to the bag provided and seal. Where large concentrations of insects exist several can be worn. For more information on Insect Bite Protection click here. Micro-encapsulated DEET uses advanced time release technology which means that the repellent vapour is released slowly over a longer period of time. This kind of DEET has several advantages: it provides long-lasting protection with lower concentrations of DEET; and reduces the number of times that re-application of the product may be necessary. We use micro-encapsulated DEET in Trek Ultra, which is designed for extreme tropical conditions – it is a popular insect repellent with expedition travellers, adventurers and the military. Read more about the technology behind micro-encapsulation here. How can I stay bite free? Trek 20 is a deet spray that is ideal for everyday travel in tropical areas. It is the mildest strength insect repellent in our DEET range and is ideal for family use.